So how far can go for love? Will you be willing to change everything about yourself to make your beloved fall for you? 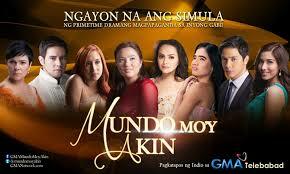 These are just some of the questions you’d ask when you watch Mundo Mo’y Akin on GMA 7. It all started with two best friends who weren’t gifted with physical beauty. One had undergone plastic surgery to earn love and bore a physically not pretty baby (Marilyn) while the other was blessed with a beautiful child borne out of a foreigner father (Darlene). The former was afraid that she’d be rejected by her love and his mother once they see the unappealing appearance of the child. So they switched the newborn babies. The prettier of the two grew up not lacking in anything including financial provisions while the latter grew up loved but in a poor home. Hence, the show is called thus because Darlene’s world belonged to Marilyn. Marilyn eventually got her life back though. Yet she actually made the same mistake as her mother, which is to change how she looked through surgery in order to gain familial approval. Through all the seemingly roller coaster ride of a life, there was one guy for Marilyn and it’s Jerome, the same guy whom Darlene also loves. I’m quite certain that despite the sort of “you and me against the world” drama, Marilyn and Jerome will ultimately be together till the end anyway and I’m sure that these remaining weeks will lead towards that. As always, the Alden Richards and Louise delos Reyes tandem is effective if you’re looking for that “kilig” factor. All other cast and characters make the show come alive as well. See Wikipedia for the complete cast information. But other than the story line and its cast, the subtle idealisms are also noteworthy. Plastic surgery to change one’s look in order to boost confidence is one. This can be considered both empowering and demoralizing at the same time. Women are encouraged to improve themselves yet in a superficial way as if they’re not confident about whom they really are to begin with. So how far can go for love? Will you be willing to change everything about yourself to make your beloved fall for you? Catch Mundo Mo’y Akin on its remaining episodes every weekdays before My Husband’s Lover.